Shots by Miko in collaboration with Stylez Remedy is having our third pop up shop! This pop up shop is one of those planned to take place all over Kansas City as a collaborative effort amongst small business owners to expand each one’s audience. We want to make sure Kansas City knows about Shots by Miko and its amazing beverage capabilities in both alcoholic and non-alcoholic formats as we will have the options available to be taken home as well. Shots by Miko will be on site serving up custom options, creating a space to chat, mix and mingle with light snacks as well as offering an opportunity to meet the Shots by Miko team and the venue owner. The theme for this one is Take Us to the Beach- we’ll be showcasing a variety of beachy beverage options. This event is open to the public & free of a cover charge. Join our #SbMFish Loyalty Program while you’re on site as well. 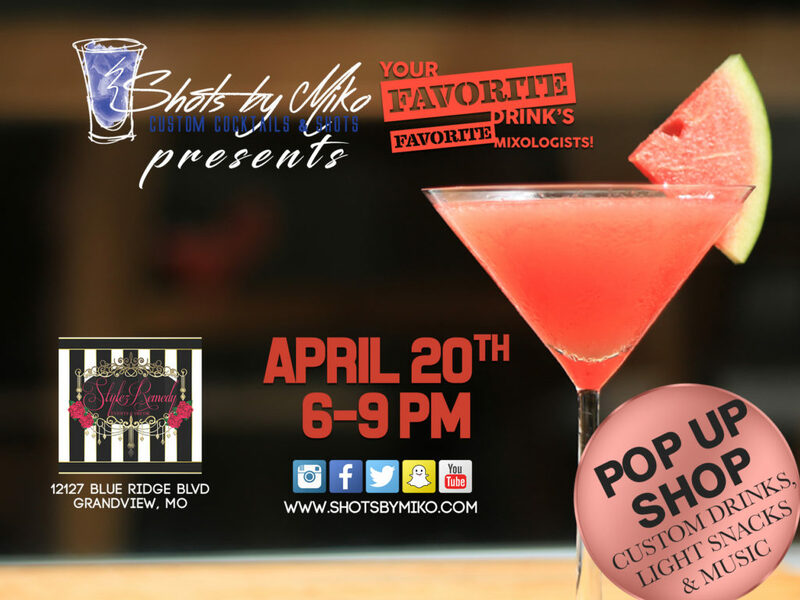 We hope to see you at the Shots by Miko: Custom Cocktails & Shots Pop Up Shop! If you have ever attended a Shots by Miko event previously, you know we ALWAYS show you a great time!